Macon Speedway was built in 1946 by Wayne Webb on the site of a brick factory on Macon’s West side. It has been in continuous operation since its inception. The facilities have undergone many changes over the years, but the track’s size has remained the same since it was first constructed. The track’s length has been stated as both 1/4 (.25) mile and 1/5 (.20) mile at different times. It has been touted as “The World’s fastest 1/5 mile dirt track” for many years. It was also formerly known as “The Other Brickyard” — “Other” being a reference to the Indianapolis Motor Speedway’s nickname, and “Brickyard” due to buried bricks rising up to the track’s surface from time to time. Many famous drivers who compete on dirt tracks have been to Macon at one time or another. In 2007 Macon Speedway was sold again. 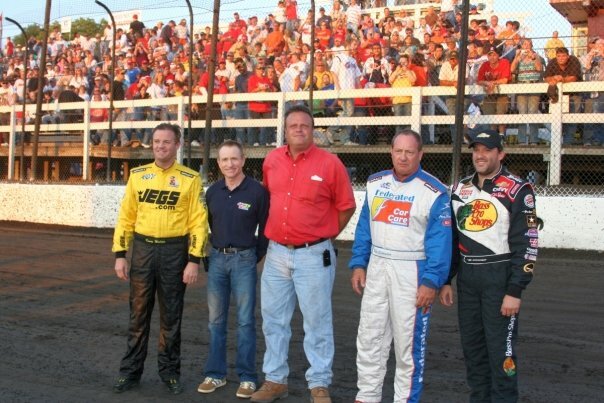 Former Macon Speedway owner Bob Sargent teamed up with NASCAR stars Ken Schrader, Kenny Wallace, and Tony Stewart as co-owners of Macon Speedway. Many improvements were incorporated into Macon Speedway’s infrastructure, including new catch-fencing, upgraded grandstands, new billboards along the backstretch, and the acquisition of 12 acres (49,000 m2) of adjacent farmland that was converted into a pitstop-area for the racers. Those improvements, along with 3 nights of racing that included NASCAR race drivers, helped restore Macon Speedway to its former glory, and drew sell-out crowds almost every race night for the 2007 season. The owners also added money to the weekly pay-outs, and added “Big Money” ($1200US or more for the winner) races to the regular schedule. The 2008 season included many of the same big races, as well as a new crowd draw, rides in Macon Speedway’s new 2-seat late model.